Love playing video games? Love helping out kids in need? Well you’ve come to the right place! 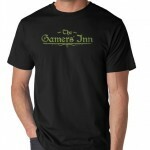 On October 25th The Gamers’ Inn will be embarking on an epic journey to play video games for 24 hours straight in support of Children’s Miracle Network Hospitals in Extra Life 2014. To check out our team and get more information on the event go to bit.ly/TGI2014. Throughout the 24 hour event we’ll be broadcasting from the Amove TV Twitch page, but there will be plenty of other places to catch the team gaming. The best way to keep up on the action is to bookmark this page! 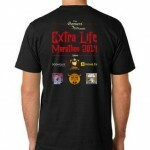 To celebrate our 2014 Extra Life marathon we’re offering a special T-Shirt that looks cool, features all our amazing sponsors, AND helps out the charity. It’s WIN-WIN-WIN! Designed by Amove TV’s Garrett Weinzierl you can grab this stellar tee featuring art on the front AND back. 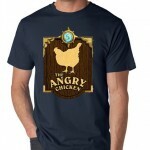 Use the code EXTRALIFE2014 to get $3 off your purchase of a The Gamers’ Inn, Zombies Ate My Podcast, The Angry Chicken, Azeroth Roundtable, Tauren Think Tank and our super awesome 2014 Marathon T-Shirt. 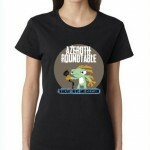 Not only do you get a discount but a portion of the purchase will also go towards Extra Life! It’s win-win!